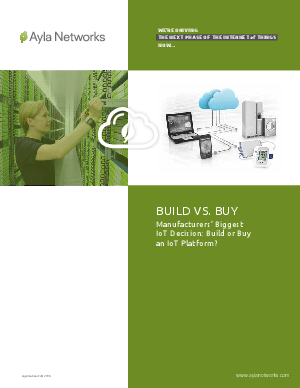 > Ayla Networks > Manufacturers’ Biggest IoT Decision: Build or Buy an IoT Platform? Before deciding if they should tackle building their own IoT platform, manufacturers face additional questions: Do we have a clear understanding of what building an IoT platform entails? Can we build appropriate connectivity, security, responsiveness and reliability into every aspect of IoT operation? Do we have the in-house expertise in all the areas of technology that are involved, including their interactions and handoffs? If not, how much time and cost will it take to gain that expertise? Will we be able to keep pace with the technologies and users’ expectations as they continue to evolve over time? In the end, does it make more business sense to build or buy an IoT platform?